Women on Fadiouth Island in Senegal prepare millet, a locally grown food staple, to make couscous. For the world’s poor – including smallholder farmers as well as urban and peri-urban households – rapid rises in food prices can have immediate and sometimes devastating effects. Households may have to forgo other expenses, such as school fees or doctors’ bills, to keep food on the table, or in the worst cases, they may go hungry. Price volatility thus creates food and nutrition insecurity for millions of people. It can also trigger political unrest; there are many examples of rapid price increases causing latent social and political tensions to erupt into more overt demonstrations and protest. 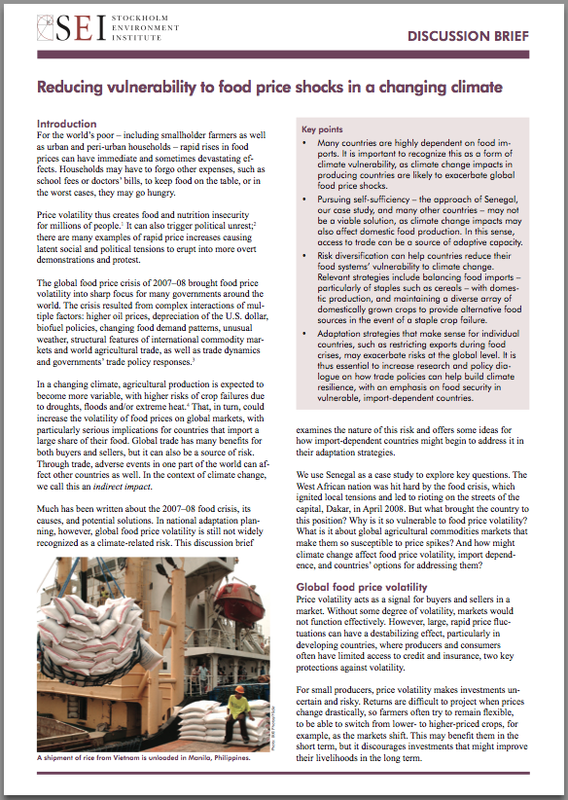 The global food price crisis of 2007–08 brought food price volatility into sharp focus for many governments around the world. The crisis resulted from complex interactions of multiple factors: higher oil prices, depreciation of the U.S. dollar, biofuel policies, changing food demand patterns, unusual weather, structural features of international commodity markets and world agricultural trade, as well as trade dynamics and governments’ trade policy responses. In a changing climate, agricultural production is expected to become more variable, with higher risks of crop failures due to droughts, floods and/or extreme heat. That, in turn, could increase the volatility of food prices on global markets, with particularly serious implications for countries that import a large share of their food. Global trade has many benefits for both buyers and sellers, but it can also be a source of risk. Through trade, adverse events in one part of the world can affect other countries as well. In the context of climate change, we call this an indirect impact. Much has been written about the 2007–08 food crisis, its causes, and potential solutions. In national adaptation planning, however, global food price volatility is still not widely recognized as a climate-related risk. This discussion brief examines the nature of this risk and offers some ideas for how import-dependent countries might begin to address it in their adaptation strategies. We use Senegal as a case study to explore key questions. The West African nation was hit hard by the food crisis, which ignited local tensions and led to rioting on the streets of the capital, Dakar, in April 2008. But what brought the country to this position? Why is it so vulnerable to food price volatility? What is it about global agricultural commodities markets that make them so susceptible to price spikes? And how might climate change affect food price volatility, import dependence, and countries’ options for addressing them? Many countries are highly dependent on food imports. It is important to recognize this as a form of climate vulnerability, as climate change impacts in producing countries are likely to exacerbate global food price shocks. Pursuing self-sufficiency – the approach of Senegal, our case study, and many other countries – may not be a viable solution, as climate change impacts may also affect domestic food production. In this sense, access to trade can be a source of adaptive capacity. Risk diversification can help countries reduce their food systems’ vulnerability to climate change. Relevant strategies include balancing food imports – particularly of staples such as cereals – with domestic production, and maintaining a diverse array of domestically grown crops to provide alternative food sources in the event of a staple crop failure. Adaptation strategies that make sense for individual countries, such as restricting exports during food crises, may exacerbate risks at the global level. It is thus essential to increase research and policy dialogue on how trade policies can help build climate resilience, with an emphasis on food security in vulnerable, import-dependent countries. Import-dependent countries should aim to diversify their sources of risk by balancing imports with domestic production, where suitable. This requires investments in the whole food value chain – from farming and harvesting, to processing and marketing of domestic produce. Despite the political importance of price stability for staple crops such as rice, the focus should not be exclusively given to any one crop; “lock-in” to single crops may exacerbate climate change vulnerability for import-dependent countries. Diversifying agriculture and diets – for example, by improving the competitiveness of locally produced alternative staples – should also be seen as elements of a robust climate change adaptation strategy to maintain food price stability. Food diversification may also bring benefits in terms of nutrition security and enhanced coping capacity for households. Donors can play an important role in assisting countries to reduce their vulnerability to food price shocks, such as by investing in storage facilities and crop research. However, public finance can only go so far. Governments must seize opportunities to leverage private finance and private-sector participation, including, potentially, via climate finance mechanisms, particularly in the development of food supply chains. A much greater emphasis on trade and adaptation issues is needed in the global debate on climate change, including under the United Nations Framework Convention on Climate Change (UNFCCC), and in climate-related research. The Adaptation Committee should consider how to appropriately raise trade policy concerns, especially on behalf of LDCs, at the UNFCCC as well as the specific role of international institutions for adaptation related to trade. Given the low likelihood of achieving progress on trade-related issues at the UNFCCC, however, and the complexity and strategic interests that are at stake in agricultural trade negotiations, it is important to intensify research and policy dialogue on the role of trade dependence in climate vulnerability.